CW is what you make it. During the day the hot frequency is 14040 plus or minus QRM, followed by 7030 or 21040 if it's open. Try 7030 at the top of each hour, 3540 early and later in the party when the sun goes down. 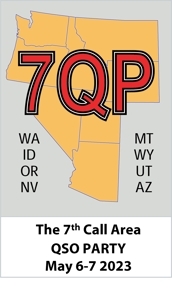 Call CQ 7QP at your most comfortable speed and answer those who call. Short CQs are best. If someone comes back at you too fast, tell him to QRS! He wants your county, he will do what you say. Similarly, if you find someone sending a fast CQ, answer it with just your call, once - at your favorite speed. The other guy will come back to you and will usually match your speed. Use the standard abbreviation for your state/county from the rules sheet. Send "(his call) ur (RST) (your county code)". Like this: WS7N ur 589 ORDES. Get his RST and county, state, province, or DX in return. Finish with "tu QRZ de (yourcall) 7QP" - especially if there was more than one station answering your last CQ. Always assume there's someone listening to your last QSO and waiting for you. Don't repeat anything unless asked. If you need a repeat, ask for it. In theory, the contact doesn't count unless you get it right. After you get his exchange, the other station is waiting for a "QSL" or "tu" from you, or a "?" if you need it again. If you work a station operating on a county border he will give you two counties. Paper logging them is easy but except for N1MM, most logging programs will not allow you to enter both for one contact. The solution is to enter his call again as a second QSO for the second county. Both of these contacts will count. If you CQ for two minutes without an answer, either change to "search and pounce" and tune for CQs or go to another band. Everyone else is doing the same thing. Agility is the key! You get 50% more points per QSO on CW than phone so being a little slower is not necessarily a handicap. Doing even a little CW gives you a real advantage over anyone who tries it on Phone only. It's a fixed format exchange, you don't have to copy more than his call, your RST and his location. Short and sweet. It's a great way to brush up on your code speed if it's been a while.